Highly perfumed and vividly coloured the frilly flowers of Dianthus Unforgettable are borne in good number above the attractive glaucous blue foliage so distinctive of all of this family. Flowers are held on short stems well clear of the foliage and are 1-2 cm across. Unforgettable is a distinct new form of this wonderful family of plants. 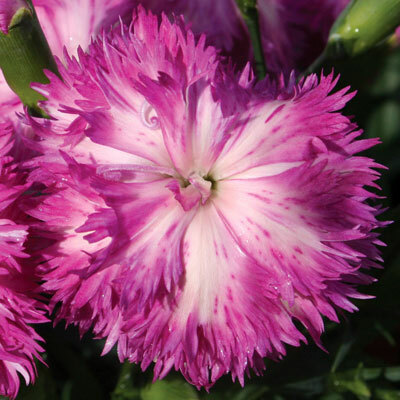 There has been so much hybridization between the various similar plants in this family which includes the Carnation that it goes without saying that some attributes of these other plants are likely in the genes of Unforgettable through the cross breeding. Flowers can be used for small floral arrangements and last well. In pots or gardens the show made will be one that stands out amongst other plants. Dianthus plumarius is native to the northern hemisphere growing from central Europe through into Russian Siberia. Plants were collected before the middle of the seventeenth century and in England, more particularly Scotland were treasured and carefully nurtured. The Cottage Pink of British gardens was developed from these early introductions and now has a place in garden folk law. From the time the English estates came into their own until the present day these plants have been of great interest to gardeners everywhere. Unforgettable is derived from this vast history, it's exact parentage is unknown.